Apartment with swimming pool - Wifi + linen included - optional AAC, parking. 1 bedroom - furnished terrace - swimming pool - Salou's centre - beach closeby. Apartment with air conditioning in a residence with community solarium terrace and swimming pool, standing in the very centre of Salou, really close to the sand beaches as well as to all facilities and activities. This apartment, on the fourth floor (elevators), is bright and comfortable. It counts with an independent bedroom with two single beds and a storage closet with safe, a complete bathroom, renovated this year with a big shower plate and washing-machine, and an open-plan kitchen, well fitted out with oven, cooktop, big fridge-freezer and storage, leading to the living room, prettily decorated, with a double sofa-bed, television screen with satellite and access to international channels, as well as the optional air conditioning. From the living room, you have a direct way out, thanks to a picture window, to a pleasant covered and furnished terrace (table and chairs) with views onto the centre of Salou and street downbelow, providing therefore an additional dining area to enjoy beautiful summer days. Functional and well equipped (oven, big fridge, storage, fans, etc...) for 5 people (yet with a comfort capacity for 4 people) with an additional single bed available (it has to be installed in the living room), it includes the complete linen (sheets and shower towels) and an unlimited Internet Wifi connection. For more comfort, the air conditioning, installed in the living room, and a private parking spot in the residence next door are available, as optional services. For stock reasons, it is recommended to confirm parking in advance. It is part of a residence with elevators, secure access with digicode and in which you'll find a nice community area with a large surveyed swimming pool (with a separation for young children) with sun beds, showers and high pine trees. To enjoy sunny days, there also is, on the last floor, a community solarium terrace, totally fitted out with sun beds and showers, allowing a panoramic view onto Salou's seaside resort and tourist centre. . In the heart of Salou's animated centre where you'll find all kinds of facilities (restaurants, bars, nightclubs, shops, supermarkets, chemists...), this residence stands about 450 metres from two of Salou's main beaches – Playa Capellans and Playa Llarga – and you'll find, between these two beaches and about 650 metres from the property. The pretty Cala dels Llenguadets, less busy and quieter, with fine sand and clear water, accessible by the beautiful pedestrian footbridge called Camino de Ronda which allows incredible viewpoints. You can get there using the Camino de Ronda, or walking through the main shopping street in Salou (Avenida Carlos Buigas). Catalonia applies a holiday tax, included in the rental price for the property. World Vacances Plus is a booking centre between individuals, created in 1998 and installed here on the spot, in Salou. We are here to help you with finding a holiday rental which corresponds exactly to what you're looking for, depending on your enquiry criteria, expectations and needs, and follow you through all the steps of your booking, in English, until key collection; for this property, it will take place at the reception of our booking centre, in Via Roma - Salou, with a member of our team. Being here on the spot, we personally know each of our properties and their owners and can therefore perfectly answer all your questions. - Comfortable property for 4 to 5 people, with an independent bedroom, a sofa-bed and an extra bedding, a functional kitchen and a pretty terrace, furnished as an additional dining area. - Well equipped, this property includes an unlimited Wifi connection and the complete linen and you can rent the air conditioning and / or a private parking spot in the residence next door. 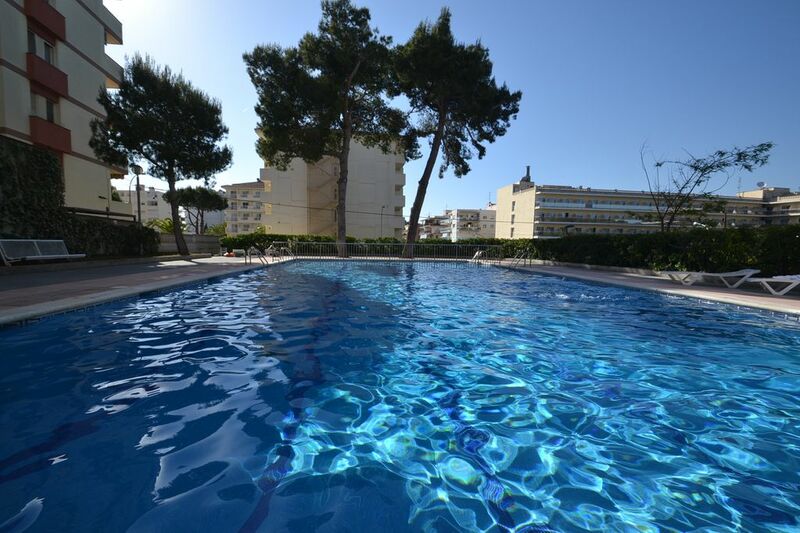 - Ideally located in the centre of Salou and close to the main beaches of the seaside resort, this pleasant residence with community swimming pool and rooftop solarium is only a few minutes from Salou's main shopping streets, facilities and activities. - Cute apartment, functional and well equipped with the linen and Internet included + optional air conditioning and parking. - Community swimming pool - animated centre - close to the beach, restaurants, bars, shops... - Ideal to fully enjoy the many activities available in Salou, without having to use your car. toilet, shower, Bathroom renovated this year with shower plate. The complete bathroom, with washing-machine, will be renovated this year and then has a wide shower plate. The air conditioning, installed in the living room, is available as an optional service : 30 Euros per week. You can rent, if necessary, a private parking spot in the subterranean lot of the residence next door: 12 Euros per day, recommended to be booked in advance. The living room in this apartment is bright and colorful, comfortable with a dining area, sofa-bed, television with satellite and access to international channels, as well as way out to the terrace. There is a first dining area with modern furnishing in the living room, before the open-plan kitchen, and a second one on the terrace to enjoy outdoor meals and drinks. There is in this apartment a flat screen television with a satellite allowing access to international channels. This property's terrace has been prettily furnished, creating therefore an additional dining area outside the living room, with view to Salou's tourist centre and the street downbelow. The access to the swimming pool has a staircase. Community swimming pool on the groud floor of the residence with a children's pool, sun beds, high pine trees and outdoor showers. You get to the swimming pool using a short staircase. The linen and Internet connection are offered and you can rent the air conditioning and / or a private parking spot. Beautiful residence with a big swimming pool, sun beds and a community solarium on the last floor. Excellent situation close to the beaches and in the plain centre of Salou's resort. Very good value for money as functional, well equipped and ideally located. Hints and tips will all be sent to you in English before your arrival so that you can get organized. Access by car: About 270 kms. from the French border - exit 35 from the AP7 motorway - Salou. Access by train: About 2.5 kms. from Salou's train station and 22 kms from Camp de Tarragona's HST station. Access by plane: About 12 kms. from Reus' airport and 90 kms. from Barcelona's airport.